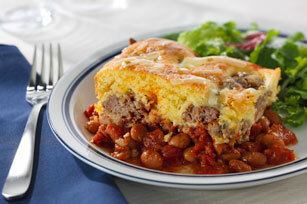 Fill a baking dish with chili, top it with halved meatballs and put dollops of corn muffin mixture on top. You just made a new family favorite. Prepare and bake Easy Basic Meatballs as directed. Combine beans, tomatoes and seasonings; spoon into 8-inch square baking dish sprayed with cooking spray. Prepare corn muffin batter as directed on package; drop in spoonfuls over cheese. Bake 25 min. or until cornbread topping is lightly browned. Sprinkle with remaining cheese; bake 5 min. or until melted. Prepare using KRAFT Sharp Cheddar Cheese. Heat oven to 400ºF. Mix 2 lb. extra-lean ground beef, 1 pkg. (6 oz.) STOVE TOP Stuffing Mix for Chicken, 1 finely chopped onion, 1 cup water and 2 eggs just until blended; shape into 48 (1-1/2-inch meatballs). Place on 2 rimmed baking sheets sprayed with cooking spray. Bake 12 min. or until done (160ºF). Use 12 meatballs to prepare casserole as directed. Cool remaining meatballs, then place in freezer-weight resealable plastic bags and freeze up to 2 months before using as desired.